This course provides educators with specific tools to increase the students' ability to understand and apply what he/she is learning. It provides an educator with remedies to non-comprehension, slow students and tools for keeping a student interested and engaged. 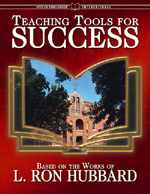 It is based on the Study Skills For Life book that teaches the basics of Study Technology.